The Flying Dutchmen totaled 642 points and topped fourth-place Albion by 19 points. Calvin repeated as league champion with 863 points, while Kalamazoo was second with 672. Junior Duncan MacLean of Grand Rapids, Michigan (East Grand Rapids HS), finished MIAA runner-up in the 1,650 freestyle. He clocked a time of 16:22.07. Senior Grant Ludema of Ada, Michigan (Grand Rapids Christian HS), placed eighth at 17:14.80. Senior Erick Skaff of Flint, Michigan (Carman-Ainsworth HS) took 15th in 18:21.67. 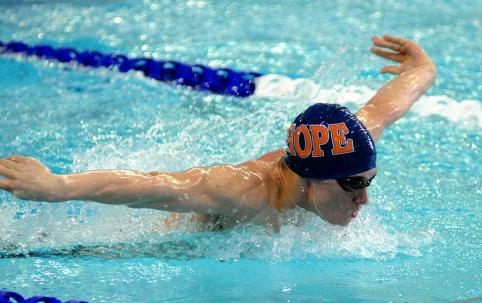 Freshman Mike Wurster of Indianapolis, Indiana (Brebeuf Jesuit Prep), was MIAA runner-up in the 200 backstroke. He clocked a time of 1:52.73. Three of his teammates also competed in the championship final: sophomore Christian Otteman of Zeeland, Michigan (Zeeland East HS), in fourth at 1:54.41, sophomore Danny Sullivan of Columbus, Ohio (Upper Arlington HS), in sixth at 1:58.08 and senior Christopher Waechter of Ventura, California (Foothill Technology), in eighth at 1:59.61. Freshman Charlie Emmert of Grand Blanc, Michigan (Flint Powers Catholic HS), claimed MIAA runner-up honors in the 200-yard butterfly at 1:54.61. Junior Nathan Rommel of Overland Park, Kansas (Blue Valley NW HS), was fourth with a swim of 1:55.70. Skaff placed 10th at 2:01.51, while junior Micah Sall of Zeeland, Michigan (Zeeland East HS), came in 13th at 2:04.08. Hope finished MIAA runner-up in the 400 freestyle relay. Sophomore Ryan Johnson of Milford, Michigan (International Academy), junior Samuel Gallmeyer of Grand Rapids, Michigan (East Grand Rapids HS), sophomore Jonathon Maat of Holland, Michigan (Holland HS) and MacLean clocked a time of 3:08.14. Junior Jeff Zita of Holland, Michigan (Holland Christian HS), placed third in the 200 breaststroke with a time of 2:05.78. Two more were in the consolation final: sophomore Trevor Wagoner of Hixson, Tennessee (McCalle HS), in 11th at 2:12.65 and freshman Nick Olen of Midland, Michigan (Lyons Township HS), in 13th at 2:13.70. Johnson took sixth in the 100 freestyle final with a swim of 47.29. Two made the consolation final: Gallmeyer in ninth at 47.95 and Maat in 10th at 47.98.